Effective this upcoming season "Pick -your- own Apples" will no longer be possible at the orchard. In our efforts to be consistent with the growth of our orchard, we have chosen in a strategic business decision to focus on larger production volumes for the wholesale market. Consequently, a decision to close access to the fields was made for a few reasons such as salubrity of the farm and logistic efficiency. Producing fresh and the best quality of apples remains our priority. 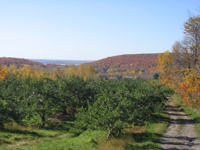 We will keep on supplying the Quebec market with our apples and specialty brands. And for our clients who still wish to buy their favorite apples from our orchard, our stand located at the entrance will be open every week-ends from September to mid-October. For anyone still wishing to pick their own apples, we recommend you visit other orchards located nearby. We thank you again for your patronage in these past years. 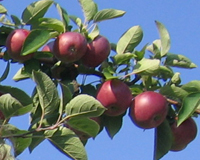 The harvest calendar this year could be slightly later for some varieties For more info on available varieties, the probable fruit ripeness or suggested use, refer to our section The Apples or the descriptive chart. Stand available on Starting September 16th . You can't wait that long ? Try the Delfcorf ; Crunchy, juicy, sweet and ready beginning of September !